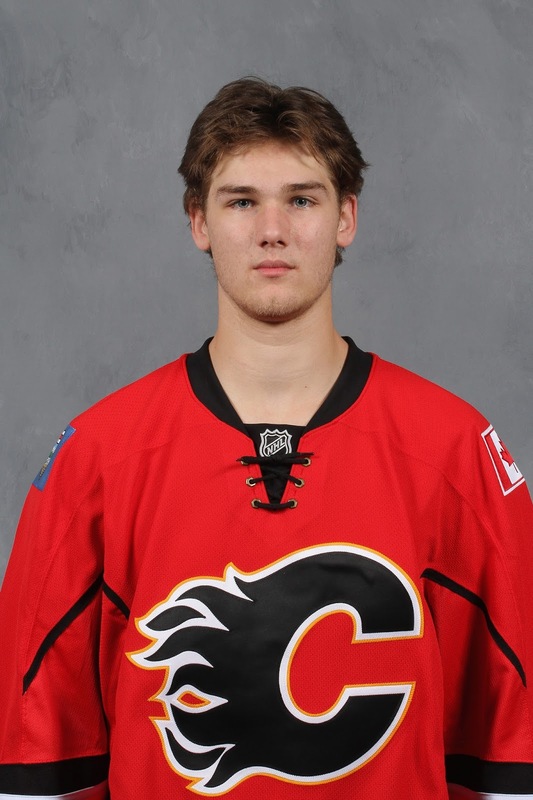 Mark Jankowski was a hot topic in Calgary on June 22, 2012, when general manager at the time, Jay Feaster, went off the board to make him the 21st overall selection in the NHL draft. Not helping matters was assistant GM John Weisbrod promptly describing him as a young Joe Nieuwendyk. Geez, could you put any more pressure on the kid? Passing on a player like Finnish defenceman Olli Maatta, who went to the Pittsburgh Penguins with the next pick, the Jankowski selection is a move that was widely panned at the time and that criticism has never gone away. Now, 1,373 days later, Jankowski is a hot topic once again as his NCAA career came to an abrupt end on Friday when Providence College, the defending national champs, were upset 2-1 in double overtime by Minnesota Deluth in a regional semi-final. 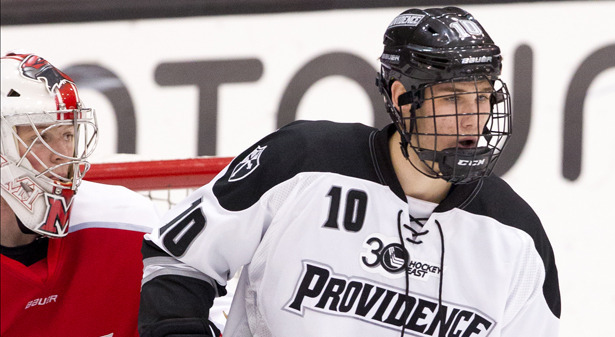 #Flames prospect Mark Jankowski was ill, not injured, last night as Providence was eliminated from NCAA tourney. Several IV bags post-game. So, now what? Eric Francis reports that Flames assistant GM Brad Pascall and other team personnel were at the game in Worcester, Massachusetts, with the intention of offering a contract to Jankowski should such a result happen and Providence not make it back to the Frozen Four. Guess it's come time to sit back and see what happens. In the meantime, here's a primer on Jankowski and his situation. In a special edition of Eight From 80 Feet, I present eight thoughts on what could be and what should be next for Jankowski while also clarifying some of the CBA rules around his situation -- potential free agency, compensation pick, etc. The CBA has a provision that if a team is unable to sign a first round pick, they are compensated with a second round pick of the same number. The spirit of this rule is to not give teams a mulligan should they blow their first round pick and want to pick someone different, it's to give them a safety net should they legitimately try but be unable to sign a player drafted in the first round. What does "legitimately try" mean? It means making a "bona fide" contract offer to that player. This is set out in section 8.3. (b) of the CBA. In other words, it's not as simple as some are suggesting that Calgary can merely walk away from Jankowski by waiting until he becomes a unrestricted free agent on August 15 and then claiming a compensatory pick. To qualify for that pick, they need to have offered Jankowski a contract that he rejected. 2. What Would a Jankowski Contract Look Like? Based on the age Jankowski will be when he signs his entry level contract (he turns 22 on Sept. 13), his deal can only be two years, which is a rule stated in the CBA. This was identical to the situation with Kenny Agostino and Bill Arnold most recently, who both played their full four years of college and then signed with the Flames. AHL - Minimum salary is $45,000 and is capped at $70,000. * If the two-year deal does not begin until next season (so year one isn't burned), the minimum salary jumps $75,000 to $650,000 in year two as this incremental increase in the NHL minimum salary is scheduled in the CBA to kick in for 2017-18. What can optionally be offered on top of that is a limited set of NHL performance bonuses. However, the thing to keep in mind if you're of the mindset that Jankowski will need to spend a couple of years seasoning in the AHL anyway -- and I have yet to run into anyone that doesn't feel this will be the case -- the NHL money and any bonus clauses become a moot point on this initial two-year deal anyway. Ideally for the Flames he signs a contract that kicks in next season and that leaves the door open for him to immediately join Stockton for the remainder of this season on an amateur try-out (ATO). That is the only way he is permitted to play in the AHL this season. Rules in the CBA stipulate that a player is not eligible to be sent to the minors when he signs a contract after the NHL trade deadline that begins that same season. 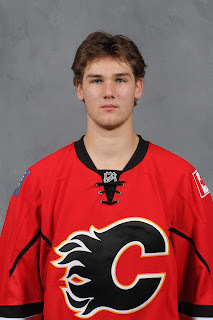 As a first round pick, who was named a Hockey East first team all-star in 2015-16 and is coming off his best offensive season, make no mistake there would be NHL teams very willing to sign the 6-foot-4 centre should he reject any Flames offer and opt to try free agency. This is what happened with Johnny Gaudreau's Boston College linemate Kevin Hayes two years ago. He spurned the Chicago Blackhawks, who originally drafted him, and waited until he became a UFA and then in a bidding war, chose to sign with the New York Rangers instead. So while the Flames cannot just choose to not offer Jankowski a deal if they felt (which I don't believe they do) that a compensatory pick is a better option, they could present him an offer that is for the minimum across the boards -- e.g. $45,000 AHL, $575,000 NHL and no bonuses -- that would surely be rejected. Heck, if I'm the advisor representing Jankowski, I'd view that type of an offer as an insult and would definitely rather take my chances in free agency where there would be more than enough interest from other NHL teams to produce a much better contract offer. For Jankowski, that could mean signing a contract in the next few days that begins this season. Typically this also comes with an assurance of NHL games and we've seen this scenario numerous times recently with Ben Hanowski, Agostino, Bryce Van Brabant, along with the Arnold-Gaudreau situation two years ago when Boston College was knocked out of the Frozen Four in the semi-final and both signed immediately then flew to Vancouver to appear in the Flames regular season finale. If this was to happen with Jankowski, it means his two-year deal begins this season so in 2016-17, he would already be in the final year of his entry-level contract. Players often see this as to their advantage. It gets them out of their ELC quicker and gets them into a potentially more lucrative standard player contract. That said, I've been told by NHL management personnel in the past that sometimes teams prefer this option also. The theory being with older college players, you typically know if they have NHL potential or not pretty quickly compared to 18-year-old kids in major junior. A shorter contract length enables the organization to cut bait earlier on a player that they feel has no NHL future. Jankowski's numbers do not blow you away. His 40 points (15 goals, 25 assists) in 38 games as a senior was the best of his four years in college but at that, is not anywhere near the production you typically would expect to see from a college player that has a long NHL career ahead of him. He played for a school that was very defensive focused. The MO for Providence under coach Nate Leaman has not been to outscore teams, but to keep games low-scoring and win with defence. One of Jankowski's strongest attributes is said to be his defensive game. He was always billed as a long-term project. Nobody should be expecting his rookie point total to be where it would be with other players that were less raw. So if you look at things like NHL equivalency that suggest Jankowski has no NHL future, that's being overly presumptuous with someone still 21 years old, who does come with some unique circumstances. While it's far from a certainty that Jankowski will ever make it to the NHL, are you really better off with a 51st pick? Three reasons I'd be skeptical are Flames hopefuls Emile Poirier, Hunter Shinkaruk and Morgan Klimchuk. Selected 22nd, 24th and 28th respectively in the 2013 NHL Draft, I'd argue none of them are any more assured of gainful NHL employment down the road and they're late first round picks, the odds are that much more stacked against you to find a NHLer late in the second round. Still basking in the 2015 draft, it's easy to point to Rasmus Andersson, who was taken 53rd as an example of the calibre of player you can get in the range of where that compensatory pick would be but let's just pump the brakes on assuming two things: (a) Andersson is a lock. Yes, he looks like a steal but many have prior. Let's see him at the pro level. (b) Considering the Flames had Andersson ranked significantly higher, I'd view him as the exception, not the norm. If you look at the players drafted in the range of 49 to 53 over the 12-year span of 1998 through 2009, only 11 out of 60 players ended up playing 200-or-more NHL games. That's a success rate of 18 percent or less than 1-in-5. Those aren't very good odds. However, there are also 26 (43%) that never played a single game and 37 (62%) that played 20 or fewer. Does Jankowski have a 20 percent chance of making it to the NHL and being a regular? I would think so and if that's the case, playing the odds would suggest sticking with Jankowski and seeing this experiment through to a conclusion. Yes, Jankowski was a controversial pick when they made it and for many fans, the bitterness persists because of how Maatta turned out. 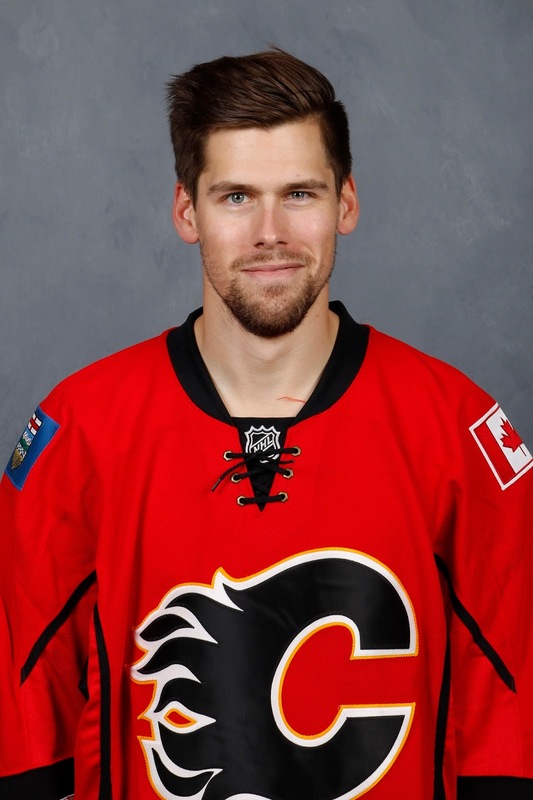 However, was the Penguins defenceman even the guy the Flames had next on their list anyway? Because there was lots of dreg that came right after that. The next six players selected after Maatta have combined for 22 NHL games so while you can cherry pick when it comes to the 'what if' scenarios with the draft, those conversations have two sides. 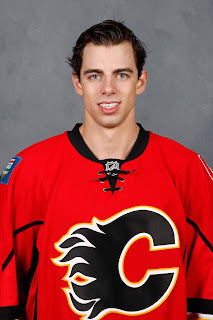 What if Calgary chose goaltender Chris Driedger instead of Jon Gillies in 2012? Driedger was picked next by Ottawa. What if Calgary chose left-winger Emil Molin instead of Johnny Gaudreau in 2011? 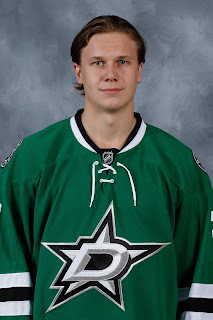 Molin was picked next by Dallas. 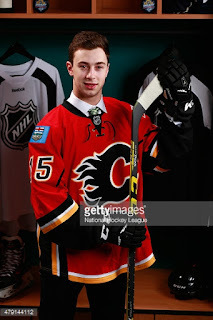 What if Calgary chose defenceman Sean Lorenz instead of TJ Brodie in 2008? Lorenz was picked next by Minnesota. So knock yourself out, go ahead and selectively lament the fish that got away, but holding that pick against the player seems counter-productive. It was hardly Jankowski's fault. That management team has moved on. Seems like fans should too. Maybe let the guy turn pro with a clean slate and see if he can continue to flourish. He's gotten better every year while at Providence, who is to say that development won't continue. 8. What Could He Be? What is the upside for Jankowski? For me, I would think he could become a third line NHL centre eventually, emphasis on 'could'. We've seen his skill, most recently at development last July when he stood out. He's had some end-to-end rushes in college that have found their way to YouTube also. If his defensive game is sound and he can be proficient at the face-off dot, a centre that is 6-foot-4 and over 200 pounds has value. Maybe he could become the replacement for Mikael Backlund when he potentially moves on in two years. Right now, Backlund is an excellent fit at centre on this club alongside Sean Monahan and Sam Bennett. But two years from now when the Swede is a UFA and looking for a significant raise from his current AAV of $3.6 million, can Calgary afford to re-sign him if they're already paying big money to Monahan and Bennett? Probably not so that could be a role Jankowski could slide into as someone not at Backlund's calibre but with a salary that fits. For me, Jankowski is definitely worth signing and having a look at him as a pro. So much time has been invested in him already, it's the right move. And unless the Flames seriously insult him with a low-ball contract offer, I truly believe there's a deal to be made. I've spoken with Jankowski many times over the years and he has always come across as legitimately appreciative of the Flames organization for how they've treated him. I could be wrong and maybe I've completely misread him but I just can't see him bolting. That just doesn't seem to be in his make-up. Sign him right away, throw him a few games down the stretch because why not. I'm pretty sure we know what Brandon Bollig is by now, or Matt Stajan, etc. As someone that would not count as one of the Flames permitted four AHL call-ups (because he's not coming from the AHL), there are slots Jankowski could slide into on this roster just to give him a taste and to give fans a preview also. To assume Calgary would be better off with 51st pick in the 2017 NHL Draft is a stretch. At that point in a draft, you're looking at a guy that could maybe help the Flames five years from now at the earliest. Look at it like that and suddenly waiting a couple more years to see if Jankowski pans out doesn't seem like that bad of an alternative. For those that claim to know with certainty what Jankowski will be, they're lying. Sure there are indicators but he's also a unique case. The bottom line is nobody knows for sure what this guy will become. With Mark Giordano and TJ Brodie both late bloomers, and as I just wrote about, with Andrew Mangiapane potentially another, if there's one fan base in the NHL that should know better than to pass judgement and give up on someone too quickly it should be the residents of Flames nation. Four years ago, Andrew Mangiapane was deemed not good enough to play in the OHL. On Wednesday, he signed a contract to play in the NHL. Man, that is one heck of a career arc. "It has been a roller-coaster," Mangiapane admitted on Wednesday, reached by phone in Barrie. "It's surreal how I've come so far. It just blows me away." He says it was three or four weeks ago when the Flames approached his agent, ex-NHLer Claude Lemieux, saying they wanted to get Mangiapane's name on an entry-level deal. "Claude told me they want to do a contract so let's get it done as soon as we can, before the playoffs. It just happened so quickly after that." When the deal was struck on Tuesday, the contract was sent to Mangiapane so he could sign it, scan it, and return it to Lemieux. Except there was a problem. Who owns a scanner these days? The Mangiapanes hopped in their vehicle and made the 40-minute from their hometown of Bolton and met their son at Milestones. After enjoying a nice meal, although not an expensive celebratory one just yet -- "I didn't want to stick my parents with too expensive of a bill," he laughs -- he signed the contract at the restaurant and his parents took it back home with them to scan it and send it on to Lemieux. It was a special night for the whole family. "They put in so much time, money, effort. So for them to see me so happy, I think that's what really made the moment for them," says Mangiapane, who also has a couple sisters in his fan club -- one older, one younger. Caught up in the euphoria, it's easy to forget that for the longest time, it looked like such a moment was never going to happen. Passed over entirely in the 15-round draft was Mangiapane, who was listed at the time as 5-foot-7 and 140 pounds. It was the first of two humbling slaps in the face for the Italian. That summer, prior to spending the next season playing midget AAA with the Toronto Jr. Canadiens, Mangiapane attended a hockey camp in Wasaga Beach. The camp was run by Barrie assistant coach Todd Miller and he left a favourable impression, apparently. "After seeing me there, Todd invited me to Barrie's rookie camp the following year. When I did good there, they invited me to main camp. At main camp, I turned heads and the scouts and the coach Dale Hawerchuk were impressed and they signed me," Mangiapane says. "It came right out of the blue. I was shocked by it. Originally, going to Barrie's camp, I just wanted to see how I measured up to all these big names they had and see if I could have a career in hockey." In his rookie season, which was also his NHL draft year, Mangiapane put up solid numbers with 51 points (24 goals, 27 assists) in 68 games. "I have to give thanks to Dale and Todd and all the coaching staff and management," he says. "I don't know where I'd be or if I'd even still be playing hockey if they hadn't believed in me and put me under their wing. I'd probably be in school right now, getting my education." Instead, he's living the dream while getting a real-life hockey education from one of the most skilled small forwards to play the game. Drafted first overall in 1981, Hawerchuk -- listed at 5-foot-11, 185 pounds -- amassed 518 goals and 1,409 points in 1,188 games over 17 seasons. "When a hall-of-famer believes in you and says hey, you're a good player, we want to sign you, that made me believe in myself that much more," says Mangiapane, who idolized Marty St. Louis growing up. It's called the NHL draft but for many, it's also known as the day of broken dreams. Mangiapane attended the 2014 NHL Draft in Philadelphia with three Barrie teammates -- Aaron Ekblad, Brendan Lemieux and Kevin Labanc. The result was an oh-so-familiar story. He admits it was disappointing. "I was the only one that didn't go from our team," he says. "We were going out to eat and they were all excited and I was happy for them and everything... but I was a little bit depressed too." He knew that after just one season of major junior, not getting drafted was a possibility, but it didn't make it any easier. "However, I knew it wasn't the end of the road for me either and I used it as motivation." His determination showed in his sophomore season as Mangiapane racked up 104 points (43 goals, 61 assists). Surely that would catch the attention of scouts, even if he was carrying the baggage of being a re-entry into the NHL draft. At that 2015 draft in Sunrise, Florida, round 3 came and went, round 4 came and went, round 5 came and went. Still nothing. "When it got into the sixth round, now I was getting nervous," recalls Mangiapane. "I started thinking to myself, oh no, it's going to happen again." But early in round 6, with pick No. 166 -- the same pick the Flames used in 1987 to select an under-sized forward named Theoren Fleury, GM Brad Treliving headed up to the podium and called Mangiapane's name. Viewed as a superb talent to be found so late in a draft, Mangiapane's stock has only risen ever since. Considering the previous year, Calgary used its sixth round pick to acquire journeyman Lane MacDermid from Dallas, who played one NHL game, 25 AHL games and then quit hockey, Calgary has to be ecstatic about how Mangiapane is panning out. There's been a few diamonds mined out of the sixth round in recent years -- Mark Stone, Cam Atkinson, Tommy Wingels, Carl Hagelin and Nick Bonino to name a handful, but finding top end talent that late in the day is rare. You're in 'found money' territory if a pick that low becomes an impactful NHL player and Calgary's recent track record would corroborate that. Tim Harrison, Coda Gordon, Ryley Grantham and Brett Sutter to name a handful. 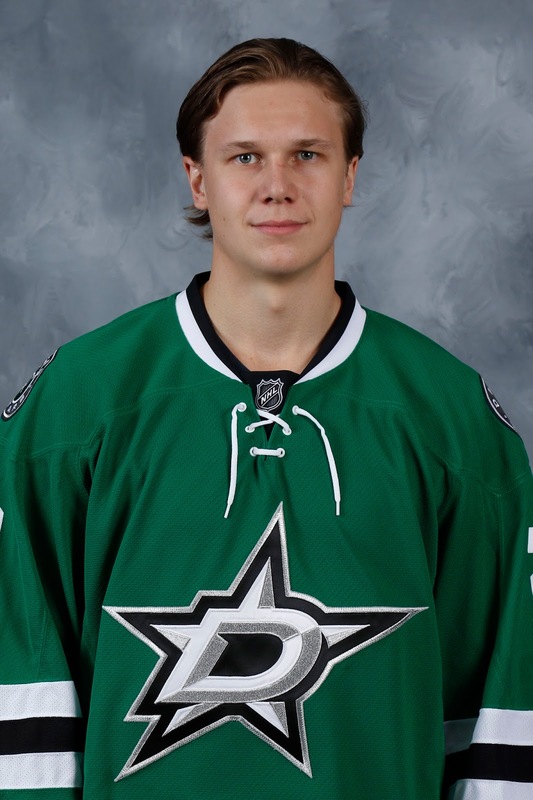 Joni Ortio was a sixth round pick so I suppose there's still a sliver of hope there. In 2010, the Flames traded their sixth round pick to the Sharks to get Henrik Karlsson. Ugh. Since arriving in the Flames organization, it's been nothing but positive impressions for Mangiapane. He wowed fans at development camp in July. He was one of the Flames most exciting players at the rookie tournament in Penticton. "That was a great experience. I saw a lot of different people and I learned a lot in Penticton," he says. "It was just a fun time and it gave me the motivation to get to that next level. I went back to Barrie wanting to do well so hopefully next year, I can make the jump." He certainly delivered on that. His third OHL season was a spectacular one with 51 goals and 106 points, all of that coming in nine fewer games than a year ago. In the league, he was second in goals and sixth in points. Two of the five ahead of him -- Mitch Marner (39-77-116) and Dylan Strome (37-74-111) were top five picks in 2015. Another, Matthew Tkachuk, could be a top-five pick this year. "Ya, it's been a pretty good year for me," Mangiapane understates. "Playing mostly with Labanc, Julius Nattinen, Justin Scott, Dylan Sadowy. I owe all my success to them. They're great players and they've helped me out a lot." Mangiapane, who says he is 5-foot-10 and 180 pounds, played all three forward positions this season. He spent a stretch of time at centre but most of the year has been spent on the wing, splitting time between the left side and right side. The left-shooter says he likes both and has no preference. As for style of game, he's not the antagonizer type but he won't shy away either. "I don't want to get bullied on the ice. so I try to stand up for myself," he says. "But I do try to stay out of it as much as I can and just play my game. It's never good when you are taking penalties. It hurts your team and you're sitting in the box." In December, Mangiapane served an eight-game suspension for catching an opponent in the head with a cross-check. "I was going down the wing and their guy came to hit me, I dodged him and I went to hit him back and when I went to him back, he was already falling and I hit his head. I didn't mean to do it. It was a spur-of-a-moment thing," he says. "I was surprised when I got eight games as a first offender. I don't remember being suspended at all in my minor hockey career. But you can't do anything about it." Coming up as Mangiapane surely winds down his career in junior, he looks forward to soaking up a long playoff run. The Colts open up against the Mississauga Steelheads in a best-of-seven that begins Thursday night. "It's always fun when you're coming to the rink and you're seeing your friends every day. What I'd like to get out of this is to go far in the playoffs and get some more playoff experience under my belt," he says. 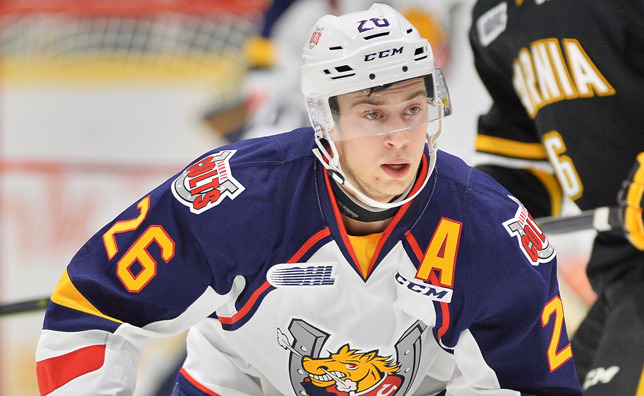 "I'd love to win the OHL and I think we have the team to do it this year." Calgary fans should be excited about the possibilities of a long playoff run too. If the Colts can pull off a league title, Mangiapane and fellow Flames prospect Rasmus Andersson would be off to Red Deer in May for the Memorial Cup. As two of the organization's top young players, you know a lot of folks in Flames jerseys would be making the drive up the QE2 if that happened. The parody Twitter account bearing his name is Boring Sean Monahan. Why it's popular and has well over 60,000 followers is because it's accurate. By that same rationale, perhaps it's come time to change his real account to Scoring Sean Monahan because that would also be accurate. Seriously, all the Flames third-year centre does is score goals. Constantly. Five goals in four games last week earned him NHL Third Star of the Week honours, and got Monahan to 26 goals for the season. With 10 games remaining, a second-straight 30-goal season is within reach. Let's not forget that Flames legend Jarome Iginla, a guy renowned for his ability to string together consecutive 30-goal seasons, never once reached that plateau in his first four years in the league. 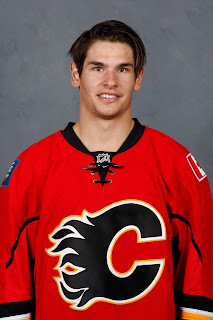 Since beginning his NHL career in October 2013, just over three months after Calgary made him the sixth overall selection in the NHL draft, Monahan has shown time and time again that give him the puck within 15 feet of the opposition net and he's lethal. The average shooting percentage for an NHL forward is nine percent. This kid is not average. It was fair to be skeptical when he scored at a rate of 15.7 percent as a rookie. Then he went out the next season and scored at a 16.2 efficiency. This year he's lighting the lamp at a 14.7 clip. It's not an anomaly when you are able to sustain it. Through 227 career games, Monahan is right back where he started, nestled in at 15.6 percent. Add it all up and you get 79 career goals for a kid, who won't turn 22 until after the 2016-17 season is underway. During his first three seasons in the NHL, Monahan currently ranks 19th in goals. He is the only player in the top 40 still on his entry-level contract. He is also one of only three players in the top 20 under the age of 25 -- Tyler Seguin (107 goals) and Vladimir Tarasenko (92 goals) are the others and at 24, they're still three years older. Coming up on the expiry of his ELC, Monahan along with his linemate Gaudreau are set to become restricted free agents on July 1 if an extension is not signed before that time. He's not going anywhere, but the question on everybody's mind is how much is Monahan going to get paid and how long will the term be when his agent Pat Morris and Flames GM Brad Treliving finally shake hands. A look at the list of the NHL's most dangerous snipers over the last three seasons gives you a sense of the kind of lucrative payday that's forthcoming. His inability to hit the open market may factor into it but so will how much his buddy Johnny fetches. If you're opening up the vault as we all expect to pay Gaudreau after two seasons, how can you not do the same for Monahan, who has piled up three great seasons. For further context to what Monahan has been able to achieve at his young age, here are the top five players in goals over the last three seasons of those still operating on their ELC. Only four crack the top 100 overall. Three years in and Monahan is giving first overall pick Nathan MacKinnon a run for his money. To be clear, I'm not suggesting the Avs got it wrong when they made the Halifax native the No. 1 selection but I doubt anyone was expecting the two to be this close three years into their pro careers. After just a dozen assists as a rookie, Monahan's playmaking has really come along nicely. Of his 29 helpers this season, 22 are primary assists. That's an impressive ratio. It's goals where Monahan is dominating MacKinnon and the rest of the field. Where Monahan's accomplishments really sink in is when you look at where his 79 goals ranks among previous draft classes. He also has more goals than anyone in the 2012 draft class and has more than all but one player from 2011. Heck, go all the way back to the 2009 NHL Draft and Monahan ranks 7th on that list, and he's just four away from cracking the top five. Think about that for a minute. 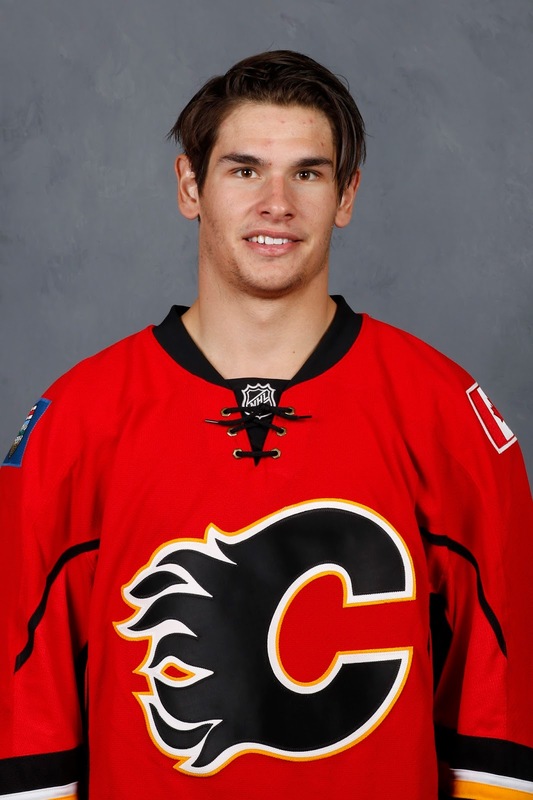 Back at that time, Monahan was 14 years old and about to begin his midget season in Mississauga. Despite giving that draft class a four-year head start, he's caught up to nearly all of them. In Flames history dating back to when the team was in Atlanta, Monahan has already climbed to 40th in goals. In the last few weeks he's passed the likes of Mike Bullard, Dion Phaneuf, Dan Quinn, Kristian Huselius and Jiri Hudler. He's just two goals behind Doug Gilmour. If he averages 30 goals per season moving forward, he'll pass Kent Nilsson (229) to move into the top five before his 27th birthday. Wow. With Sam Bennett in the organization, there's some uncertainty as to what Monahan's role on the team will be two, three, four years down the road. Will he evolve into being a No. 2 centre eventually? That might be the case but first line, second line, it's all top six and his importance to this team isn't changing anytime soon. Critics will argue that he wouldn't have nearly as many goals if he wasn't playing with Gaudreau. Well that's probably true, but can you fault him for that? If that's the combination that works, than keep those two guys together. It's not that complicated. Plus, he did find a way to notch 22 as a rookie while Gaudreau was still at Boston College. While Gaudreau's upcoming contract is the one getting all the hype and many are expecting it to be the bigger contract of the two, one does wonder if Monahan's will be much less if it's any different at all given Monahan's body of work is three years not two, and also factoring in that he plays centre. Regardless, the refreshing thing with Monahan is he's changed the conversation when it comes to the Flames often-maligned draft history, especially when it comes to No. 6 picks. 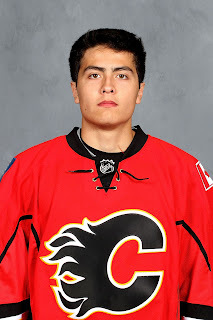 Thanks to Daniel Tkaczuk and Rico Fata, who were taken with that same selection in the 1997 and 1998 NHL drafts, the four goals those two disappointments combined to produce in their short stints with the Flames was surpassed by Monahan just 17 days into his career. Instead, the past Calgary draft pick whose name is going to start coming up as a more relevant comparable is Joe Nieuwendyk. Talk about changing the conversation. Monahan might always be boring off the ice. But as long as he remains one of the more entertaining players on it, I don't think fans or anyone other than a few grumpy media scribes with blank notepads will care. "Playing defence for your Las Vegas Black Knights, introducing number twenty-six, Tyler Wotherspoon." "Jouer la défense pour vos Nordiques de Québec, en introduisant le numéro trois, Jyrki Jokipakka." Welcome to opening night 2017-18, featuring the NHL's first two expansion teams since 2000. On this October evening just over 18 months away, the Las Vegas and Quebec City line-ups both include an ex-Flame poached from the organization earlier in the summer. So how did it come to be that Calgary could lose two solid young defencemen? It's all part of the expansion draft process, a tentative framework for which was unveiled last week at the general manager meetings in Boca Raton, Florida. Retained by the NHL and tasked with laying out the groundwork for how expansion could work was former Canucks GM Laurence Gilman. While the plan is still very much in pencil and not pen, and still has to be agreed to by the NHLPA, and while issues like no trade clauses still need to be addressed, it gives everyone some sense of how it will work. Teams can protect seven forwards, three defencemen and one goalie. Alternately, if a team is defence-rich, they can opt to protect a total of eight skaters and one goalie. Teams can lose a maximum of one player per expansion team. Players in their first or second pro season are exempt (my understanding is "pro" is defined as AHL/NHL only). Unsigned players that are greater than two years removed from their draft year would be available unless teams protect them. Teams must expose a minimum of 25 percent of their team payroll from the previous season. Of course, this all hinges on if expansion goes ahead. The league will announce this June if it will proceed and if so, whether it will be one or two teams entering the league in 2017-18. Las Vegas is the front-runner and seems most likely. Quebec City is the other candidate but they could be a victim of the lousy Canadian dollar. Based on these guidelines and assuming it will be two teams, I looked ahead to June 2017 and took a stab at who Flames GM Brad Treliving might choose to protect at that time. With five absolute must-keeps at forward, there is no question that Treliving, like most if not all GMs, would choose the first option of protecting 11 players total. These are no-brainers. Ages 23, 22 and 21 respectively as of when the expansion draft would take place, young stars Gaudreau, Monahan and Bennett represent the current and future foundation of the Flames up front. A little bit older but in their prime, Backlund and Frolik have developed into a dynamite duo of similar-styled two-way players who are also key cogs. A month away from his 24th birthday, Ferland has all the tools. When he's on his game and emotionally invested, he can be very effective. He can be mean, intimidating and can get under the opposition's skin. He can also handle the puck very well for a big man and coach Bob Hartley has always praised his hockey IQ. Regardless of how much of a scoring touch he develops, he can still contribute in plenty of other ways and is young enough still that the overall package is too intriguing to risk losing. This has been a disappointing season for the 22nd overall pick in the 2013 NHL Draft. After getting into six NHL games last year as a 20-year-old, another giant step forward was expected this season. Instead, Poirier's development has hit a speed bump and his AHL numbers are down significantly from his rookie year. If he can re-discover his Brad Marchand-like game that made him so effective in junior -- dangerous scorer, agitator that plays with an edge, he plays a position in right wing that the organization has very little depth. It's too early to give up on him yet, but he needs to bounce back next season. Colborne continues to improve each year and his offensive totals keep climbing but despite his first round pick pedigree, he's a supporting piece, not an integral piece. Bouma is a dependable, gritty bottom-six forward that could attract interest but his $2.2 million cap hit may deter teams, especially should he not be able to get back to contributing 10-12 goals next season. The red flag on Shinkaruk is why the Canucks were so determined to trade him away so soon after he was drafted. Hathaway is a likable, energy player that goes and goes but is not the calibre of player a team would prioritize as someone to protect. One scenario that could change things and bump Poirier and maybe Ferland as well onto the non-protected list is an acquisition via trade or free agency of an established top-six winger(s) this summer. But that remains to be seen. A pending UFA, if Grant re-signs this summer, he has demonstrated an ability to be a useful bottom-six NHL forward. In his short stint with Calgary, Hamilton has displayed similar qualities, the one difference being he's a RFA this summer. But 'serviceable' is not the kind of label that gets you protected nor gets you selected by an expansion team either. Minor leaguers Elson, Arnold, Shore, Agostino and Van Brabant are all pending RFAs and there are no assurances they will be re-signed. Arnold and Agostino, in that order, would be the most intriguing names. Jooris is also a pending RFA this summer. As for the veterans, Raymond and Bollig will be off the books as of July 1, 2017 anyway and Stajan will be too old and makes too much to be a guy an expansion team would have interest in. Harrison is due to graduate from Colgate University in 2017 so he would move to protected if he signs with Calgary prior to the expansion draft. Jankowski is on this list assuming Calgary signs him after his college season ends in the next couple weeks. These three are the easy slamdunks for me. The handful who are critical and/or concerned about the length of Giordano's long-term extension might consider exposing him in order to protect one of the younger defencemen like Jokipakka or Wotherspoon, but I don't think there's the slightest chance this happens and if it did, he would be grabbed by an expansion team in a heartbeat. Giordano is the captain, he's the backbone of the team and this season he's two goals away from being the first Calgary defenceman since Al MacInnis in 1993-94 to score more than 20 goals. There's still plenty in the tank with this guy. Barring a trade or buyout, Smid, Wideman and Engelland (who lives in Las Vegas in the off-season) will all be wrapping up their existing deals and will be on their way elsewhere anyway. The guys the Flames would love to hang onto based on their body of work this season are Jokipakka, Wotherspoon and Kulak and it's for those reasons that they could be the most sought after players. Young, cheap defencemen that are NHL-ready are a coveted thing for any team, never mind an expansion team. Culkin could put himself in that same mix with a strong year in 2016-17. As for Sieloff, you sense his time with the organization is running out. He would be a pending RFA after next year and may not be re-signed anyway. Ollas-Mattson is a guy that would have to be signed or else based on his 2014 draft year, would be available (see Brandon Hickey below). With the risk of losing two young defencemen a year from now, it puts an added incentive on re-signing Nakladal, who has looked fine in a third pairing role with Calgary the past month. Andersson and Kylington could also help fill the voids if the Flames lose Jokipakka and/or Wotherspoon. The Hickey situation is worth noting. Because the second-year Boston University blue-liner was drafted in 2014, Calgary would have to expose him unless he leaves college and signs with the Flames this summer or early next. I think the odds of that happening are good but it would put some pressure on the organization to get him under contract sooner than later as otherwise, I'd put him at the top of the wish list if I was an expansion team looking at the available Calgary players. This is where things gets interesting. Real interesting. In case you have forgotten as I did when I originally published this piece Saturday morning (thanks to Randy Sportak for the reminder), Gillies is currently in his second pro season. It's a detail easily overlooked given he never dressed for a game last year. But by signing when he did on April 15 with the Flames season still going and by joining the team and practicing as the third goalie, that kicked in his entry-level contract and burned the first year. So while it sure doesn't feel like it considering Gillies only played seven AHL games this year before undergoing season-ending hip surgery, 2016-17 will already be the final year on his three-year ELC. That means he needs to sign a new deal next summer and more importantly, that presumably means he would need to be protected in the expansion draft if the criteria for "pro seasons" goes by service time as calculated contractually (which I have not yet confirmed but seems logical). The ramifications of this technicality if it is, indeed, the case are significant as it means any goaltender brought to Calgary this summer with more than one year remaining (or signs a multi-year deal) would need to be left exposed in the expansion draft given the Flames won't want to risk losing Gillies, who in my latest Top 20 Prospect Rankings I slotted as the team's No. 1 prospect. Whoever is brought in to be the starter, assuming the Gillies situation is as explained above, would need to be exposed in the expansion draft. Same story for Ortio, the pending RFA who if he re-signs after this season, would be in a back-up role at best. Depending on who Calgary brings in, this goalie left exposed could attract the interest of an expansion team. It's impossible to guess given we have no idea who that person might be. 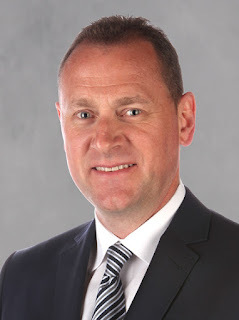 But know that whether or not the expansion draft ends up happening in 2017 and this technicality could greatly influence Treliving's approach this summer when it comes to recruiting for that starting goaltender role that is needed with Gillies expected to spend all of next season in the AHL. McDonald will likely turn pro next season and could spend his first year in the ECHL as the starter while Gillies gets the majority of starts in Stockton. Schneider is under contract already. Considering the expansion draft is still over a year away, the make-up of the Flames could change quite a bit between now and then so I'll need to revisit this exercise again later, once we know if expansion will proceed and with how many teams. I'll endeavour to get clarification around the Gillies situation also. Mind you, if a goalie brought in ends up exposed, if that goalie does get selected, that means either Wotherspoon or Jokipakka becomes safe so there's some give and take with this situation. Should expansion be delayed by a year, that is another game changer as suddenly guys like Oliver Kylington and Morgan Klimchuk are no longer exempt. It does make for good debate though and in a city in which the off-season will be a month longer than it was a year ago, the more topics like this for conversation, the better. Fourteen games to go. Halfway through Calgary's season-long six-game homestand. Sounds like a fabulous time to break out a little Stray Cats and strut through a fresh Eight From 80 Feet. In this recurring content feature which is a roundup of sorts, I offer up eight random musings on the current goings-on with the Flames. This includes what's happening with the NHL club as well as throughout the organization. So if you're ready, let's rock this town, rock it inside out. 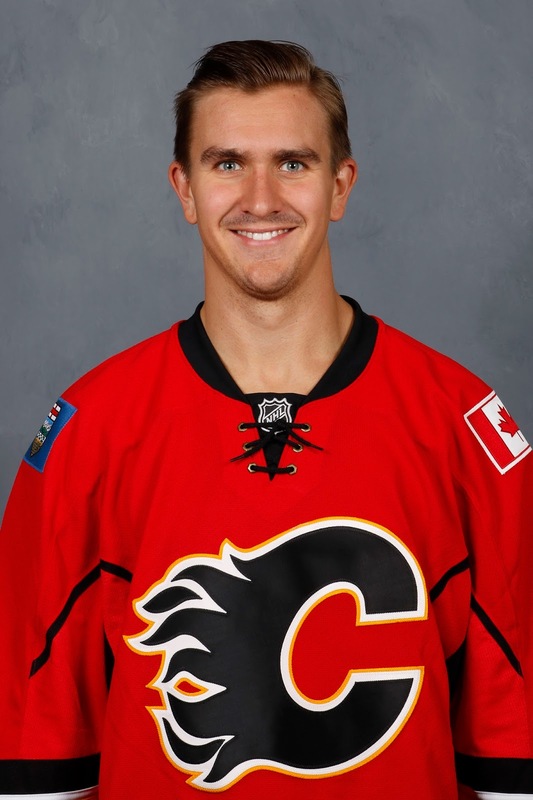 It's been quite an offensive tear recently for Mikael Backlund, who turns 27 years old on Thursday. The seven-year vet has 10 goals in his last 18 games, this coming after he scored only five times in the first 50. He is closing in on his career high of 18 goals set two years ago. Getting on the scoresheet is viewed by many as Backlund merely getting the recognition he deserves for the strong 200 foot game he already plays but it's one thing to be an excellent two-way player possession-wise, but it's also important for that territorial edge to turn into actual goals and not just shot attempts. No pun intended but the Swede has been not known for his finish in his pro career to this point. It's for this reason that an extended run of consistent production like this is exciting for the club and its fan base as it proves that he is capable of contributing at a higher end offensively than he's shown so far. Over this stretch of five-plus weeks, Backlund has been one of the NHL's hottest goal scorers. He's also been one of the team's top producers over that period. Together much of the season, Backlund and Michael Frolik have formed a really nice partnership as exhibited on Backlund's shorthanded goal on Friday. The two complement each other and given the similarities in their games and roles, I'd expect them to spend a lot of time together in the future. Last week in this piece I speculated how the Flames would use their four allotted AHL call-ups -- of which they've used two so far (Garnet Hathaway, Joni Ortio). I suggested they might keep one of the recalls in their back pocket for Grant, who had been Stockton's best player by far (23-15-38 in 30 gm) when he suffered a fractured jaw in practice on Feb. 8. This weekend, Flames assistant GM Brad Pascall told me Grant is back skating with the Heat now and that they expect he's 7-10 days away from returning. If so, that puts him back on the ice with still eight or nine games remaining on the Flame schedule. As a pending group 6 unrestricted free agent, you would think Calgary would have some interest in re-signing the 25-year-old centre given his size (6-foot-3, 202 lbs), prowess at the face-off dot and abilities on the PK. If so, a wise negotiating ploy would be to bring him up and give him some more NHL action over the final couple weeks. With playoff hopes dashed, many draft-focused fans are keeping a close eye on the inverse standings these days. While I doubt the Leafs can be caught and the Oilers, with three fewer games remaining than most of the other teams, would be the favorite for 29th, things get interesting after that. As of right now, the Flames and Jets are tied with identical 28-35-5 records and both also have 26 regulation/overtime wins (ROW). So what is the next tie-breaker? I'm glad you asked. Next they go to head-to-head record but with a catch. When the teams play an uneven amount of home games as is the case in the three-game Jets-Flames season series, the first result in the city that hosts two of the games is excluded. So the Flames 4-1 win over Winnipeg at the Saddledome on Dec. 22 is tossed out. The only game that counts so far is Winnipeg's 3-1 win at the MTS Centre on Oct. 16. The other game goes this Wednesday when the Jets are in town. If Calgary wins in regulation to make it two points each in the season series, the final tie-breaker should they be even in points and ROW at season's end would be goal differential on the season. 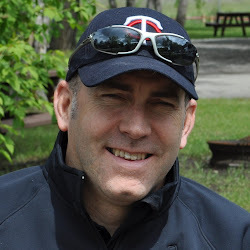 In that, Winnipeg (-27) currently holds the edge on the Flames (-31). Part 1 - The Present - With the prospects currently in the organization, what is needed, when and for how long? Part 2 - The Future - Looking at over 25 candidates to be in the Flames crease next season. At that time, it really looked like Ortio was done with this organization. There was a refusal to play him in Calgary while Kevin Poulin had been the better of the two goalies in Stockton. However, finally getting the chance to make consecutive starts, Ortio has gone on a nice little run. His 2-7-2 record doesn't reflect it as he's had a lack of run support but he's got a .915 save percentage in March and going back eight starts to when this string of playing time began, he's put up a .912. While Niklas Backstrom is owed a couple games for waiving his no-trade clause to come to Calgary, if I'm the Flames it's Ortio that gets all the stiffest challenges down the stretch. I'm talking about St. Louis on Monday, the Kings (both times), the Ducks, Chicago, etc. By the end of the season, the Flames need to know if Ortio is a legitimate option to be the back-up goalie next season or if the club is looking for two goalies this summer as I originally speculated would be the case. For one night and one night only last week, Flames fans got a sneak preview to how the team's blue-line could and should be constructed in 2017-18. In Wednesday's 3-2 overtime victory against Nashville, Calgary was missing Deryk Engelland and Ladislav Smid (both injured) as well as Dennis Wideman (suspended). As a result, the core big three of Mark Giordano, TJ Brodie and Dougie Hamilton were joined by Jyrki Jokipakka, Jakub Nakladal and Tyler Wotherspoon. The $11.7 million in salary from Engelland/Smid/Wideman was replaced by $2.6 million for the other three. That's a saving of over $9 million in salary without a discernible drop-off in play. In fact, many would argue the blue-line was better with the three younger guys. With big raises due this summer for Johnny Gaudreau and Sean Monahan, and with Sam Bennett in line for a new deal next summer. Plus, with money needed to bring in some goaltending, Calgary will need to have 'value' contracts throughout the bottom six up front as well as on the third D pairing. This is not the situation today. The question is can Calgary get to that more desirable payroll structure sooner than two seasons from now. Engelland, Smid and Wideman all have one year remaining on their deals. Because of the way buyouts work with the cost for buying out the contract spread over twice the number of years remaining on the deal, it means Calgary would have an extra cap hit in 2017-18 when otherwise those contracts would be off the books. However, the overall savings especially in cap relief in 2016-17 makes it something I wouldn't rule out. While we're on the topic, here's the cost to buy out Mason Raymond, who also has one year remaining and is currently playing in the AHL. Again, I would think this is a possibility. The buyout window opens 48 hours after the Stanley Cup final ends and expires at 3 pm MT on June 30. Dallas is second overall and if the playoffs opened today would be the top seed in the Western Conference. This is both good and bad news if you're the Calgary Flames and have a vested interest in the Stars fate given the quality of draft pick they receive from the Stars in the Kris Russell deal hinges on it. If Dallas reaches the third round of the post-season -- and home-ice advantage as it stands now would help their cause, that pick will become a first rounder in the range of 27-30. It would be 27 or 28 if they are eliminated in the conference final, 29 if they lose in the Stanley Cup final or 30 if they win it all. On the flipside, if the Stars are eliminated in rounds 1 or 2, that second round pick would almost for sure be in the 50s. That's barring the unlikely scenario that Dallas has a brutal final four weeks and all four division winners get punted from the playoffs in the first two rounds. Based on the standings today, a first or second round exit would mean the pick going to the Flames would be 55 or 56 depending on whether the Capitals get knocked out early or not. As for the second rounder from Florida in the Jiri Hudler deal, there are similar what if's. If the final standings mirror how they looked at the start of play today (so disregarding games played) so the Panthers finishing second to Boston in the Atlantic, and if there were no upsets in the playoffs, that second round pick to Calgary would be pick 53. Capping off a seven-point weekend, Flames 2015 sixth round pick Andrew Mangiapane chalked up his seventh consecutive multi-point game on Saturday with two goals -- including his 50th -- and adding an assist. With four regular season games to go, the 5-foot-10 forward has picked up at least three points in each of his last three games. Mangiapane has been especially good in the calendar year 2016 with points in 28 of 30 games and 65 points (33 goals, 32 assists) in that span for an average of a gaudy 2.2 points per game. While he is 11 months older than Dylan Strome and 13 months older than Mitch Marner, he shares the same draft year as the other two highly-touted OHL prospects, who went third (Arizona) and fourth (Toronto) respectively in the 2015 NHL Draft. After being passed over in his 18-year-old season, Mangiapane had to wait until pick 166 to hear his name hollered last year. While the age thing is certainly not something to disregard, it's maybe not as big of a factor as would normally be the case given they each have had the same amount of major junior experience. Often in these cases, the older player also has an extra full season of major junior development under his belt. Not so in this instance as all three are in their third year in the OHL. By no means am I putting the Flames prospect in the same tier as the other two, but the point is Calgary could have done far worse with a sixth round pick. That deep in a draft, you're pretty much in 'Hail Mary' territory at that point. 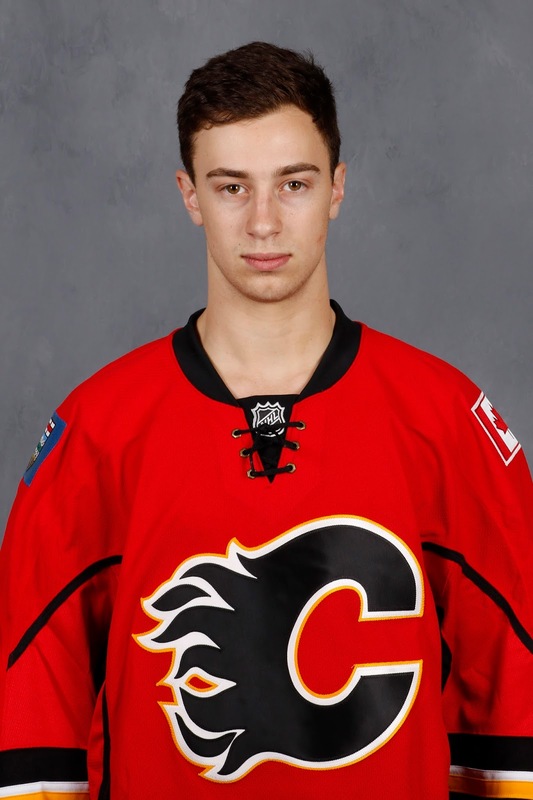 Considering Calgary's co-MVPs this season Johnny Gaudreau and TJ Brodie are both fourth round picks and given the eerie coincidence that diminutive Flames great Theoren Fleury was also taken with that exact 166th pick used on Mangiapane, there are plenty of reasons to be excited about what the future might hold for this young man, who I fully expect to turn pro next season. This kid can play. #Flames 6th rounder Andrew Mangiapane with a 7th straight multi-point game today for Barrie. He's now 50-51-101 in 56 gm. On Saturday, Flames prospects and Providence College teammates Mark Jankowski and John Gilmour, both in their senior season, played their final game at Schneider Arena, which is the Friars' home rink and located right on the campus of the Rhode Island school. The 2-0 victory over Merrimack gave Providence a two-game sweep and puts them in the Hockey East final four to be played next weekend at the TD Garden in Boston. Now a single-game elimination format, the semi-final goes Friday, March 18, and the final goes Saturday night. However, even if they lose, this isn't it for Providence. As one of the top ranked schools in all of college hockey, the defending national champs will at minimum still be an at-large invite to the 16-team NCAA Division 1 tournament that opens up in four different regional locations on Friday, March 25. It is when the Friars reach that point two weeks from now that one loss ends their season. The reason I bring this up is both Jankowski (1st round, 2012) and Gilmour (7th round, 2013) are eligible to sign contracts with the Flames as soon as their season is done. If they don't win both games to make it through that opening weekend, Calgary would still have seven regular season games remaining at that point. On the other hand, if Providence wins both to advance to the Frozen Four. Those final games at the Amalie Arena in Tampa, Florida, don't go until April 7-9. The Flames final game is on the Saturday night of the final -- April 9. Should Providence lose on that Mar. 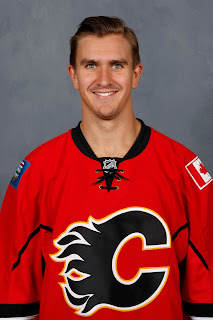 25-27 weekend, what could happen is the Flames dangle the opportunity for Jankowski to dress for some NHL games this season and sign him to an entry-level contract almost immediately. This is how things played out in the past for Johnny Gaudreau, Bill Arnold, Kenny Agostino, Ben Hanowski, etc. When you sign after the NHL trade deadline, you cannot play in the AHL so it's NHL or nothing. With Gilmour, a smaller (5-foot-11, 180 lbs) but very mobile defenceman, who has quietly had himself a career season with 23 points (9 goals, 14 assists) in 32 games, things could unfold the same way as Jankowski. Or, Calgary may try a different tact. If they are, indeed, interested in signing him and that's not a guarantee (see Coda Gordon), they could attempt to sign Gilmour to a pro contract that doesn't begin until next season. In that case, he could go down to Stockton right away, sign an amateur try-out (ATO) and play some of the final games for the Heat. This is the route Kenney Morrison took when he signed last spring. Battling some injuries, Stockton is certainly hurting for personnel on the blue-line these days and it would be a chance for Gilmour to get in his first taste of pro hockey. So keep your eye on college hockey over the next couple of weeks. A repeat trip to the Frozen Four or an early exit, it will be interesting either way.